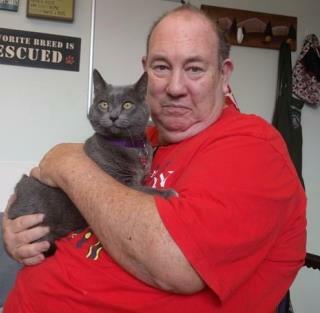 (Newser) – Misty the cat disappeared from her Portland, Ore., home in 2005. Her owners, Dean McCrea and Meredith Warren, finally gave up searching, thinking the gray feline had fallen victim to a coyote that had already killed another cat in the neighborhood. But last week, 11 years after she went missing, Misty was home again, People reports. Someone dropped her off at the Multnomah County Animal Shelter, where they scanned her for a microchip revealing McCrea and Warren as her owners, KGW reports. So, how's Misty doing after all these years? “She hasn’t missed a lot of meals. You can tell she’s very healthy,” Warren tells the news station. I'm glad Misty's odyssey had a happy ending, but it sure is mysterious. in the last neighborhood I lived in, people would panic and post to facebook immediately if they saw a cat or dog loose in the neighborhood. like hysteria......not surprised if this cat was just walking around in its own yard when someone "rescued" her.